This 3 bedroom apartment is located in Martignano and sleeps 12 people. It has WiFi and air conditioning. Property composed of 2 apartments, 8 - 12 people, 6 room/s, 3 bedroom/s, 4 bathroom/s, approximately 180 m², 1 floor/s, apartment on floor 1. Please note: No internal connecting door between the 2 apartments. Feature: Property on a manor (2 building(s) in total, 9 units in total). Furnishing: good, pleasing, tiled floor, wooden floor. Equipment: satellite TV; internet access Wi-Fi (included); combined heating/air conditioning; gas central heating. Heating if required, € 30/​day. Linen/towels available. Change of bed linen/​towels every 7 days included. Deposit € 150 (in cash). Cot € 5 per day (on order). High chair free of charge (on order). Pet 1 pet allowed, € 50 per stay (please advise prior to arrival; additional animals on request only). Access/parking: gravel road, approximately 1.3 km. 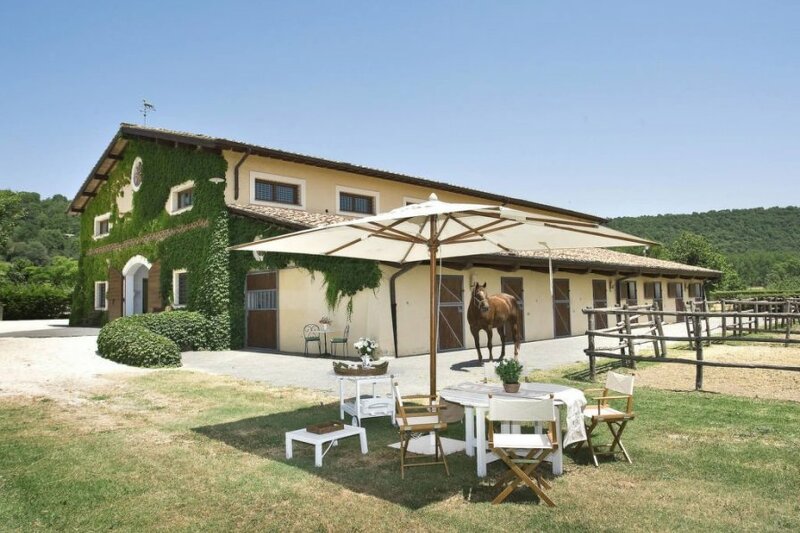 Estate (shared use): approximately 70 ha, open plot (entrance gate), meadow, fields, olive trees. Garden maintenance by the caretaker 7 time/s per week. Caretaker lives on the property. Wellness: shared use (payment): steam bath. Sports facilities/ leisure time: shared use (payment): horse-back riding. Shared use (free of charge): table tennis table, children's playing equipment. Infrastructure: reception service several hours only; washing machine (shared use, payment); dryer for shared use (payment); common room. The apartment is described as good value for money. This apartment is located in Martignano. The nearest airport is only 42km away. It is set in a very convenient location, only 150 metres away from the city center.